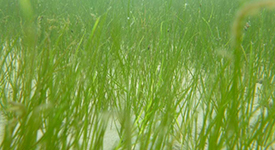 An annual survey led by researchers at the Virginia Institute of Marine Science shows that the abundance of underwater grasses in Chesapeake Bay increased 27% between 2013 and 2014, continuing an upward trend initiated the previous year. The increase reflects an upsurge from 59,711 acres to 75,835 acres, 41% of the baywide 185,000-acre restoration goal. VIMS tracks the abundance of underwater grasses as an indicator of Bay health for the Chesapeake Bay Program, the federal-state partnership established in 1983 to monitor and restore the Bay ecosystem. VIMS researchers estimate the annual acreage of underwater Bay grasses through aerial surveys flown from late spring to early fall. For 2014, the VIMS team continued the practice— first introduced in 2013—of categorizing abundance using four different salinity zones, which are home to underwater grass communities that respond differently to storms, drought, and other adverse growing conditions. Reporting grass abundance by salinity zone makes it easier for scientists to connect changes in grass communities with changes in growing conditions through time. 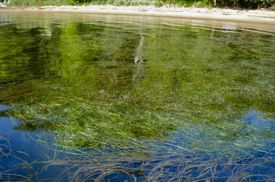 Orth attributes this year’s boost in bay-grass abundance to a continuing rapid expansion of widgeon grass in moderately salty waters, including areas in which underwater grasses had not been observed in previous surveys. Additional highlights of the 2014 survey include a modest recovery of eelgrass in the saltiest waters near the Bay mouth, where the hot summers of 2005 and 2010 resulted in dramatic diebacks, and a continued increase in coverage on the Susquehanna Flats. This area—the largest seagrass bed in the bay—persisted through 2012 and continues to return to areas impacted by Hurricane Irene and Tropical Storm Lee in 2011. Across the entire Chesapeake, bay-grass abundance has fluctuated between 38,958 acres (1984) and 89,659 acres (2002), averaging 65,806 acres. The 2014 value of 75,835 acres is 41% of the 185,000-acre Bay restoration goal. Bay grass abundance in the Bay’s fresh waters (Tidal Fresh Salinity Zone) has ranged from 6,900 acres (1995) to 25,481 acres (2008), averaging 12,496 acres. Between 2013 and 2014, bay grass abundance in this zone increased 1,320 acres to 15,305 acres, achieving 74% of the zone goal. Bay grass abundance in the Bay’s slightly salty waters (Oligohaline Salinity Zone) has ranged from 653 acres (1984) to 13,919 acres (2005), averaging 6,705 acres. Between 2013 and 2014, bay grass abundance in this zone increased 1,800 acres to 7,413 acres, achieving 72% of the zone goal. Bay grass abundance in the Bay’s moderately salty waters (Mesohaline Salinity Zone) has ranged from 15,636 acres (1984) to 48,444 acres (2002), averaging 28,159 acres. Between 2013 and 2014, bay grass abundance in this zone increased 11,850 acres to 37,260 acres, achieving 31% of the zone goal. Bay grass abundance in the Bay’s very salty waters (Polyhaline Salinity Zone) has ranged from 9,959 acres (2006) to 24,016 acres (1993), averaging 17,818 acres. Between 2013 and 2014, bay grass abundance in this zone increased 1,154 acres to 15,857 acres, achieving 47% of the zone goal.